When I was a child, the magi’s story captured my imagination. I remember my parents drawing out the Christmas season through the Feast of the Epiphany. Presents stayed under the tree, decorations stayed up, the Christ candle at the center of the Advent wreath was lit, and even Christmas music echoed in the halls of our home all the way through January 5. Without fail on the day after Christmas, the wise men would begin their journey from the far east (sofa table) traveling a little each night while we slept as they made their way to Bethlehem (next to the fireplace). 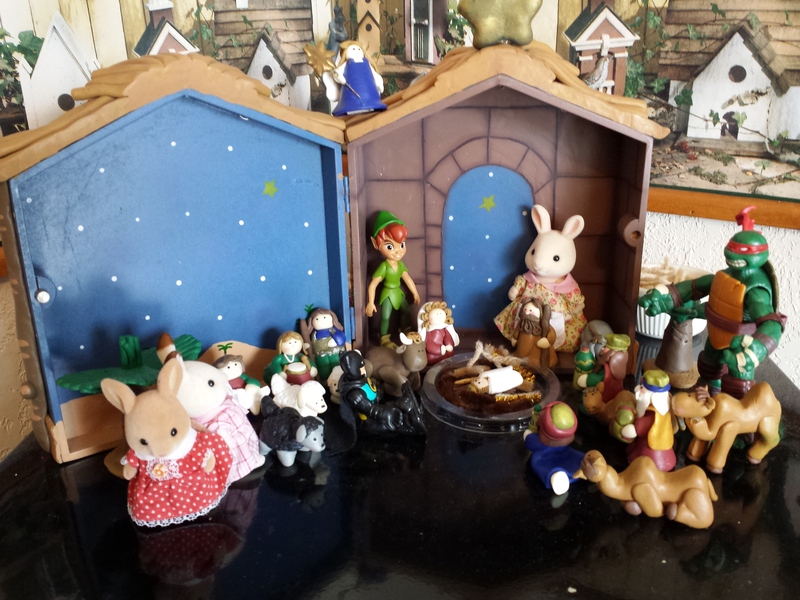 One nativity in our house this year – with wise men, wise Calico Critters, wise ninja turtles, wise Batman, and wise Peter Pan… all seeking Him. 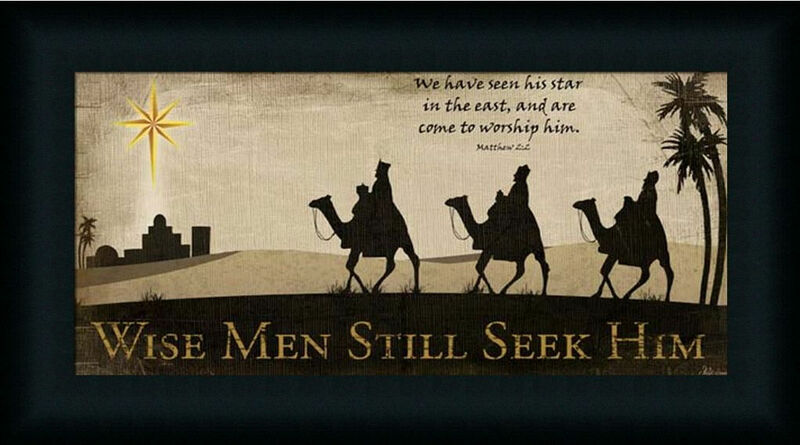 The wise men did not simply seek Him, they were the first to recognize Jesus as messiah. As the Magi strove to find the newborn king, may the Feast of the Epiphany find us not only seeking out Christ each day of our life, but actually recognizing Him as Priest, Prophet, King, and Messiah. As the Magi renounced their magical idolatrous practices in the infant face of God incarnate, may we renounce whatever worldly idols have thickened the veil between us and Christ. As the Magi blessed the Holy Family with their humility and homage, may our families be blessed humility and may we keep the adoration of Christ at the center of everything we do this year. 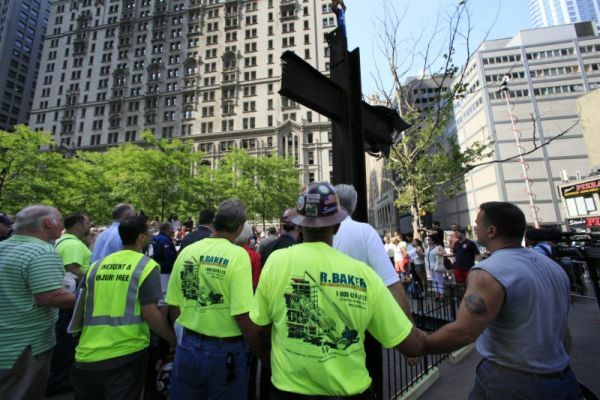 No adult can forget where they were or the emotional turmoil of September 11, 2001. Even if the frequency of our prayers or the urgency of our commitment to peace has wavered over the past 12 years, each September 11, we remember, we pray for our country, those who were lost, and those who mourn, and we recommit to working for peace in our homes, our families, and our world. I sometimes find it hard to believe that while the emotions and images of that day are seared into my memory, my children will only read about it in textbooks and hear the stories second, third, and fourth hand. For them, September 11, 2001 will be like the Pearl Harbor bombing or the WWII concentration camps were for my generation – something understood intellectually, but not experienced emotionally. There’s a part of me that is okay with that. I don’t necessarily want my children to experience the frightening emotions of that day and the weeks the followed. I don’t necessarily want my children to know the shock of watching the attack on our country happening live on TV or sorrow of watching people fall from building sides and hearing the death toll continue to rise. I don’t necessarily want my children to feel the bitter emptiness of the New York skyline. There’s a part of me that wants to protect them from all of that. However, if I engage only in an emotionless dissection of the September 11 event, my children will also never know the hope and unity that, if only for a short while, overshadowed the fear, sorrow, and brokenness of those days. I do want them to know the feelings of comfort we got from gathering as communities to pray together. I do want them to experience the unity of “one nation under God” that we were at that time. I do want them to know that divisiveness and partisanship have not always been the name of the game in Washington. I do want them to feel the peace and hope that came from the stories of ordinary people demonstrating extraordinary heroism and compassion. 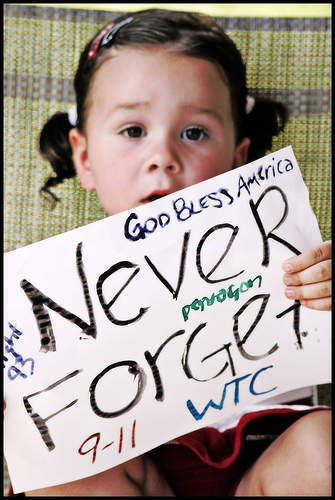 So, I will remember 9/11 with my children – not with clinical facts, but with all of the emotion those memories raise in me. I will be honest with them about what it was like to witness evil that day, and I will delight in sharing with them the many, many ways we saw good overcome evil, light overcome darkness, and hope overcome fear. My grandfather was a POW who recorded interviews and about his horrific experiences in the German camps in WWII, and he presented me the model of how I plan to remember these events with my children. He never forgot the evil of that time in his life, but each time he shared a dark or frightening story, he followed it up with a story about goodness, about the human capacity for compassion and generosity, about the power of prayer, and about how he managed to find moments of true joy in the midst of tortuous pain and overwhelming fear. Tonight and each year on this date, I’ll spend time remembering and sharing with my children the story of how we witnessed the Paschal Mystery of suffering and death leading to resurrection – of many tiny individual acts of good triumphing over a few big acts of evil. And then we’ll pray together – for those who were lost, for those who mourn, for those who still suffer from acts of terrorism, for our country, and for peace in our world. 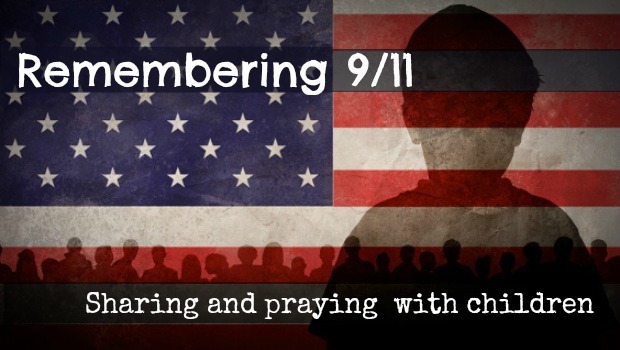 We pray for all of the people who lost loved ones on September 11, 2001. Comfort them and continue to guide them in your hope. Help us to honor the lives of those who died, through our thoughts and our actions, and grant them the happiness and joy of heaven with You. Fill us with love and forgiveness, and help us to live peacefully with each other. As we see pictures and hear memories of the suffering and confusion of September 11, help us to remember all the good that you have put in Your world. Help us, most of all, to share Your love and promises with those we meet that are suffering and confused. Do you talk about the events of 9/11 with your children? Why or why not? If so, how do you remember that day with them? Orphaned infants are being given away as prizes on a TV game show in Pakistan, prompting both condemnation and praise of the show and the organization behind the scheme. Apparently the show, Aman Ramazan, is like Pakistan’s Price is Right, a TV game show where contestants answer questions about the Quran to win various prizes, stuff like motorcycles and dryers and … babies. The show, which broadcasts for seven hours a day during Ramadan, has given away two infant children to be adopted by the winners. My initial gut reaction: How can you possibly argue that giving a baby, a child, a human being made in the image and likeness of God as a prize upholds the dignity of the human person? Chhipa Welfare Association, which takes in abandoned babies and provides a safe haven for parents to drop off those they are unable or unwilling to care for, said it receives up to 15 infants a month. 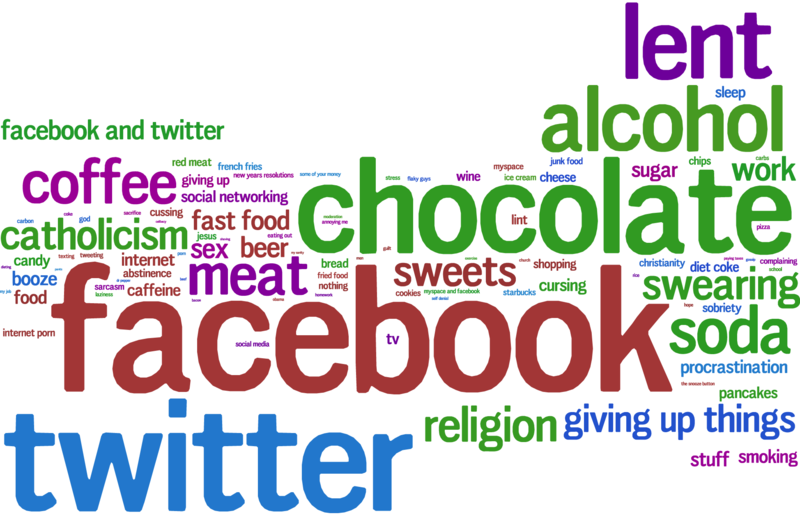 This weekend, I was one of many, many Catholics we find in the pews at Mass: Distracted and Checked Out. writing my three year old’s name for him over and over on the back of the worship aid just to keep him quiet. shushing the 6 year old who keeps up a constant stream of chatter no matter the time or location (she even talks in her sleep). 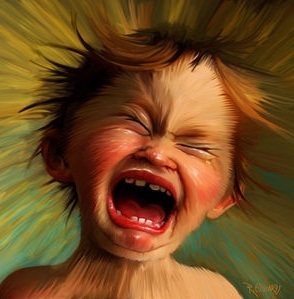 This week, before communion, as I was trying to pray to prepare myself to receive the Eucharist, the 3 year old slipped off the kneeler and smacked his head on the pew and meditative prayer quickly took a back seat to kissing the injury and active pleading to God that he would quiet down so we wouldn’t have to sneak out the side door (He did and we didn’t). Did my husband take the fish we were planning to have for dinner out of the freezer to thaw? Is it going to be warm enough to go out on the boat or to the pool? I should talk to Father about how he could easily Tweet this homily. Maybe I’ll just get him to give me a copy and I’ll Tweet it. After Mass I realized that there are a lot of times (not just during Mass) that I’m checked out of and distracted from my faith. Today is the Feast of the Nativity of John the Baptist, and in reading through the story of his birth, I realized that even some of the holiest, most church-going people in Scriptures shared in the struggle to pray well, to have faith, and to truly engage in that faith. John the Baptist’s father Zechariah was a priest who knew the promises of Scripture inside and out. 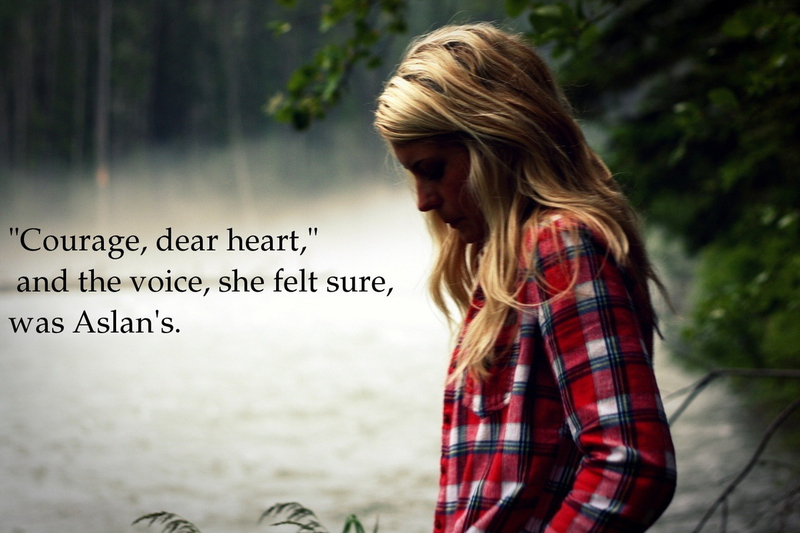 While I’m sure he had faith, he also had moments of doubt, moments where he didn’t really believe with his whole heart. Zechariah was like many of us – good people who occasionally check out and end up just going through the motions – so much so that he missed the miracle before him. Zechariah learned to trust God the hard way – nine months of being deaf and dumb. But Zechariah’s 9-month “incarceration” in a prison of silence served a greater purpose: he was able to meditate deeply on Scriptures, and then filled with the Holy Spirit, to proclaim the beautiful canticle that shows what it means to truly believe with all of his heart, soul, mind and strength. I take comfort in knowing that even a faithful old priest like Zechariah could lose a little bit of his faith, become distracted, and check out. I’m also challenged to make sure it doesn’t take an angel rendering me deaf and dumb for nine months to refocus my heart and bring me back to the joy of a relationship with a living, loving God who fulfills his promises. 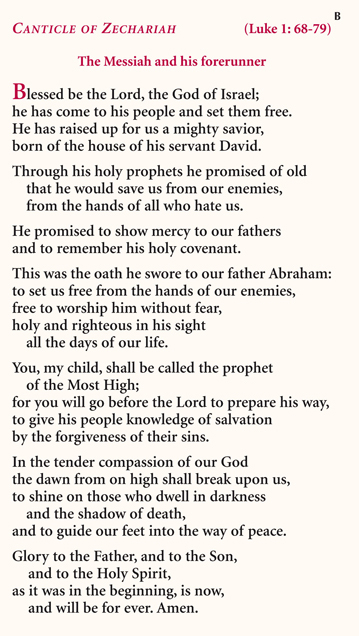 The Canticle of Zechariah has been a reminder for me that while God’s faithfulness is not dependent upon my ability to see it, my own faith is. Even if the words don’t always ring true, I pray them with hope that they’ll open my eyes so that I can remain checked in and focused on the victories – large and small – He has won, is winning, and will win for me. As with everyone else in the nation, I am saddened and disheartened about what happened at the Boston Marathon yesterday. Once again, our sense of peace and security has been rocked. And, I’ve noticed people saying that events such as these are upsetting when they happen, but not really “shocking” any more since it seems like something major like this happens fairly regularly nowadays. 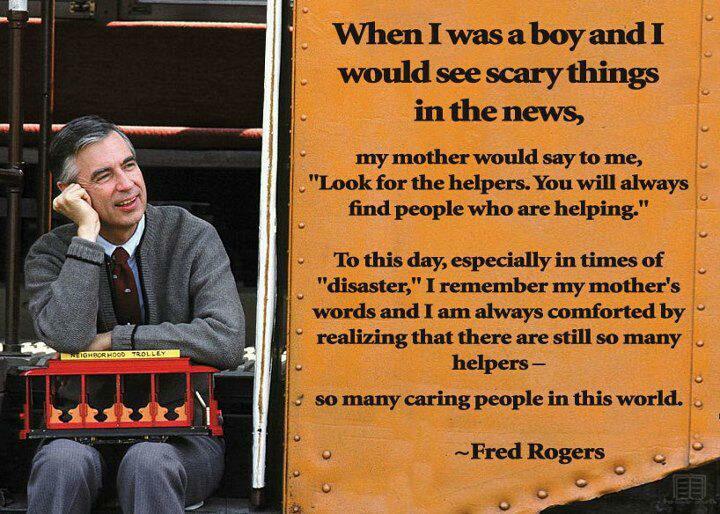 But, on the flip side, I noticed almost immediately people throwing up the Mr. Rogers quote about looking for the “helpers” in the tragedy. I’ve seen it quoted more times than I can count. And, it’s a great thought, especially for children and really for all of us. When things like this happen, we first have the shock and awe of graphic pictures and videos on the news and Internet. Everyone’s emotions get all keyed up as we try to take in exactly what happened and understand the details of the situation. But, again, it seems more quickly than usual that the stores of heroism and “helpers” have cropped up equally as fast. From runners finishing the race and running to the hospital to give blood to former NFL players helping others who were hurt to the volunteers of the race who ran towards the blast to strangers taking people in and giving basic first aid right on the scene – the good of people, of a city, of a nation suddenly came out in ways that inspire and move us. But, why, oh why, does it take a tragedy – a bombing, a school shooting, a natural disaster – to get the best out of us? Somehow, on a daily basis, we miss the need of our neighbor to be carried, to be comforted, to have the “bleeding” of broken hearts and lives tended to. We don’t run towards those who are suffering in less obvious ways – from loneliness, fear, being unloved. We aren’t rocked by the events that are blasting apart families and taking innocent lives. We walk past those crying, calling out, shell-shocked, who just need someone to see them and care for them in their hour of greatest need. This is what our country needs – a revolution. But not just any revolution. 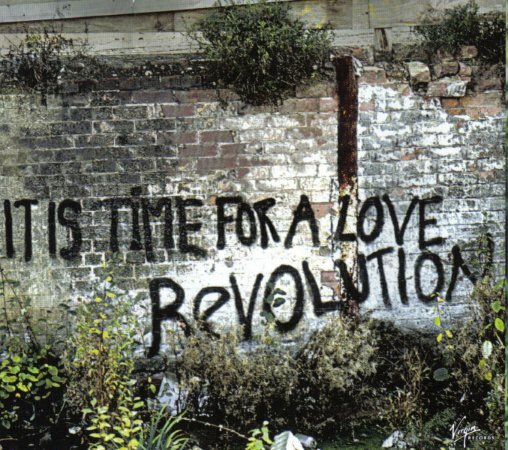 We need a revolution of Love. We need to be fighting to out love each other, to see who can do more, give more, who can be pushed to the highest heights of the love we were meant to share. We’ve proven over and over again when tragedy has struck that we are, indeed, a Christian country, who’s values are firmly planted in the understanding that God IS love and we have a responsibility and innate desire to show that love to others. But, when will we start living that on a daily basis? When will we stop waiting for things to get really bad to start doing the most good? 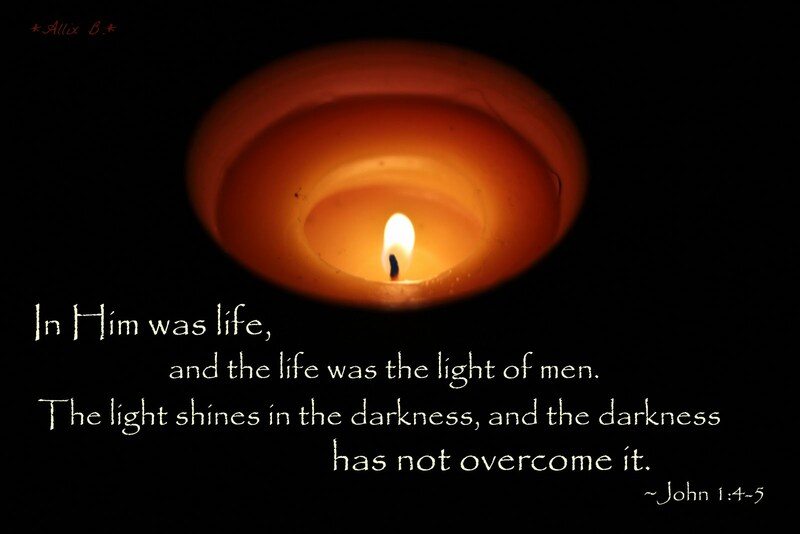 I am praying for the people of Boston. I am praying for those “helpers” and heroes. I am praying for those who inflicted this type of pain on innocent people. But, mostly, I am praying that we, as a nation, as people of God, will not stop here. I am praying that we will really begin to live our faith and start the revolution of love. It’s time.